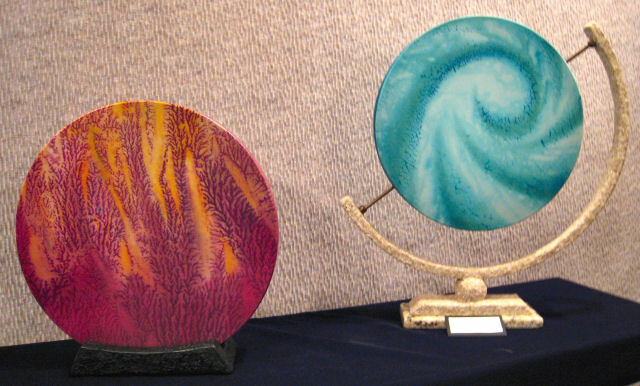 Joanne Schilling creates "music wrapped in art" here in wave drums, meant to be "in your hands and on your walls". You can hear the ocean waves as you move the silk-covered drums. My wave drums, rainsticks and shakers incorporate multiple techniques, from fabric dye-painting to a hearty stone-like paper mache. Vegetable dextrin resist, shibori (a Japanese tradition), stamping, wet on wet dye-painting, silk-screening and metal and leather embellishments are layered into my pieces. Early musical instruments were originally created from indigenous materials, and in that spirit I enjoy the challenge of re-using or re-cycling materials at hand whenever possible. Integrating sight, sound and touch (visual-audio-kinesthetic), each piece embodies a complete art-experience for those living and interacting with my work. Nancy L. Davis is on a journey of discovery as she is taking full advantage of having a window of opportunity to pursue her art full-time. She has immersed herself in the art community to learn and be inspired. In this exhibit, her batik explorations are offered as well as her playful aprons, an unusual use of fabric scraps, plastic and pocketed hot pads.